Curse the camera! Nowadays movie posters are usually airbrushed digital images, ones that leave little room for the old hand-drawn poster to get a nose in. That idea is now 'classic' or 'retro', despite flick pin-ups being a core part to the portfolio of the original 'airbrush'. Click to enlarge and scope out the level of that detail! Behold how this handcrafted wee gem shows the power of the force never ages. Be it in Jedi mindtricks or illustrated poster art. 'Nuff said! Dear god that is indeed pimptastic, sir! I should very much like a copy of that in ginormous-size for one of my walls. 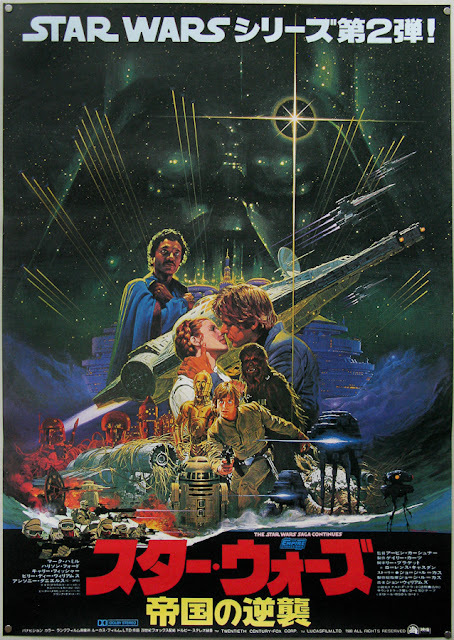 For me this poster captures what star wars is. The monumental epic story, childhood memories, the great fantastic space fantasy. great find Dan. Glad you both liked it guys and welcome to IADW Omega Agent1! If only it did come in wall sized edition Pensol - then I'd be grabbing me one, and I'd probably even shout you yours - ya know assuming there was enough in stock! OA - I think you hit the Yoda on the head with that one. 80's posters often had that whole story montage thing going on, and it really gave them that epic feel. PS folks OA runs the first blog I'm aware of dedicated to the true top martial artist of the DCU, Bronze Tiger. Check him out over at http://thebronzetiger.blogspot.com! I have this hanging in my office. It was originally owned by my best high school friend, Daigoro Oyama. He had it in his room and I always use to comment on how great it wasa; when we graduated, he gave it to me as a gift. It is definitely one of my prized possessions. It would be one of mine too Kyle, Thanks for commenting!